New VisuMap release with support for k-NN. We have just releaseed VisuMap version 3.5.888. Apart from the new special release number, this version offers the k-NN (k nearest neighbors) classification service. k-NN is kind of a modelless supervised machine learning algorithm, it uses the training data directly as the "model", whereas other classification methods, like SOM (self-organizing net), uses a network trained with the training data as model. This post describes a variation of the algorithm Relational Perspective Map (RPM). The new algorithm, called generalized RPM (gRPM), is more sound from the view point of simulated dynamical system; and produces in general more consistent maps. gRPM has been implemented in VisuMap and has been available since version 2.4. In the following I'll first review the RPM algorithm; then describe gRPM for a special case that employs flat torus topology; I'll then discuss possible variation and extension of the algorithm. Figure 1: RPM as a mapping algorithm. 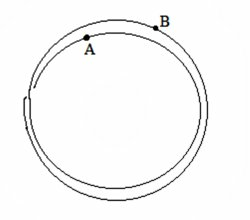 Figure 2: RPM dynamics anomaly on a ring: the force from A to B+ and B_ have different direction even B+ and B_ can be arbitrarily close to B. 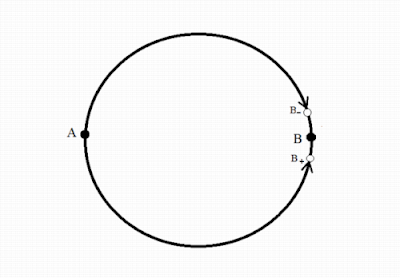 In above diagram, the repulsive force between A and B can quickly change the direction when the particle B moves from position B_ to B+, because the repulsive force follows the minimal path that changed from upper half arc to lower half arc. As will be shown latter, this kind of discontinuity can lead to unwanted artifacts in the resulting RPM maps. In order to fix the discontinuity problem described above, the gRPM algorithm extends the interaction between two particles to multiple paths between them. In the case of ring topology, gRPM defines the interaction between two particles as superposition of two forces: one along the upper arc and one along the lower arc in above picture. 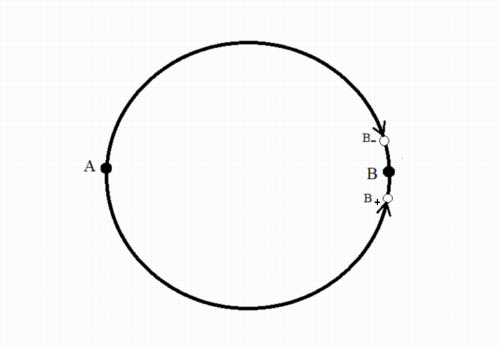 By this definition, when two particles are at exact opposite positions, A and B, on the ring, the two paths between them (i.e. the two arcs) will have equal length, so that the two forces will have equal absolute value but opposite direction. Thus, the two forces will cancel out each other; and the two particles can stay stably at the position A and B. Figure 3: Interval representation of a ring topology. We can easily verify that Fij, as a function of x and y, is not continues when |x-y|=w/2. But, F*ij is continues and has the value 0 when |x-y|=w/2. Figure 4: Four paths between two points on a flat torus. Opposite edge of the rectangle should be consided stuck together. The consts w and h in above equation are the width and length of the flat torus respectively. Figure 5: Mapping 1000 data points sampled from a sphere surface to the flat torus: a) The original dataset displayed as scatter plot in the 3D sphace. 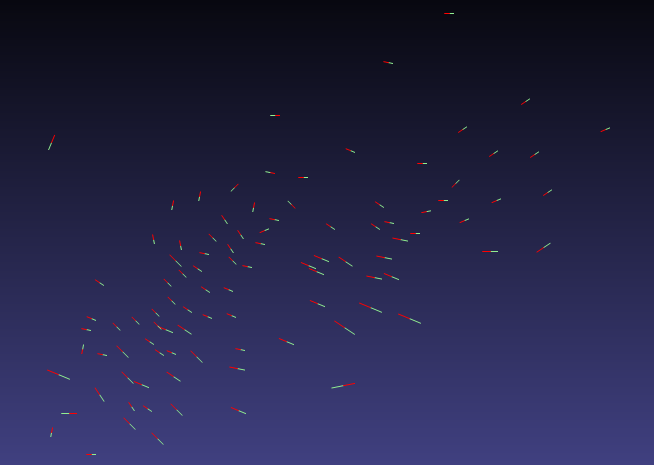 b) The map generated by the RPM algorithm. 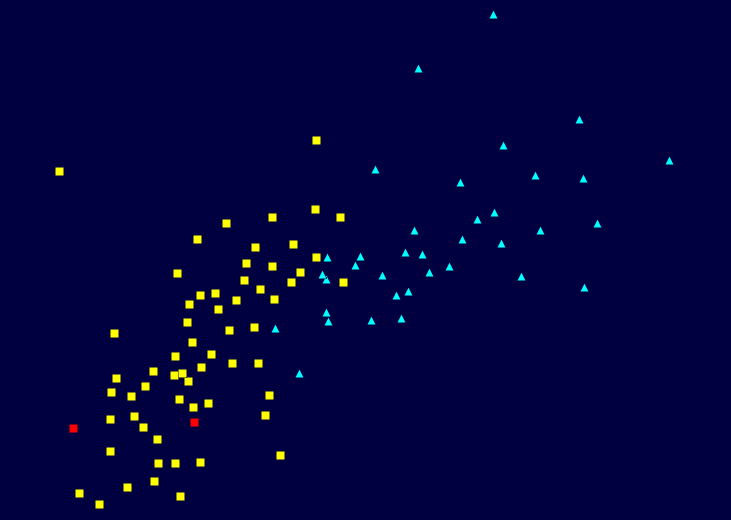 c) The map generated by the gRPM algorithm. We notice that there is kind of framing effect in the map generated by RPM algorithm: high concentration of data points along the boundary of the two square fragments. The map generated by gRPM does not suffer from such framing effect. The key technique to move RPM to gRPM is to find a set of "conjugated" paths, so the forces induced by them will cancel each out at those "discontinuous" configurations of RPM. With this technique we have worked out gRPM algorithm for other relatively simple spaces (e.g. 2D smooth manifolds). In VisuMap we have implemented gRPM for flat klein-bottle, flat sphere, flat real projective plane (all flat fundamental polygons), 3D sphere and the projective plane in half-sphere model. The set of conjugated paths for these manifolds comprise 2 to 8 paths. The initial RPM algorithm defines the energy as 1/dpij, where p is any positive number. Just for the sake of simplicity, we have here just considered the case p=0. The handling of other values for p should be analogous. In fact, for any smooth monotonously increasing function h(x), we can use the function 1/h( dij) as energy function for gRPM. Notice that, for the ring topology, the two "conjugated" paths form a complete winding loop (see Figure 1.) As an extension, we could require that the path pair forms two winding loops. 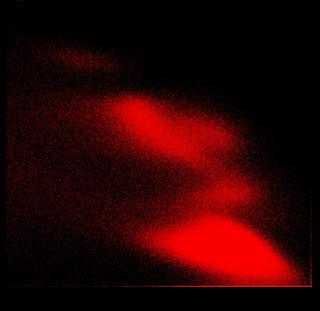 As shown in the following diagram, two particles will have minimal energy when they are at the same spot (that is the same phase but different loop). Thus, the repulsive force will be effectively turned into attractive force. In general, we can easily verify that, for the ring topology, the interaction is repulsive when the path pair forms odd number of loops; and is attractive when the path pair forms even number of loops. This kind of winding number resemble the spin numbers of bosons and fermions in particle physics. It might be interesting to investigate gRPM for these more general cases. Visualization of high-dimensional data with relational perspective map, James X. Li, Information Visualization 2004; 3, 49-59.
carmcorder to make videos for YouTube. It was a challenge to squeeze the large screen HD pixels to youtube sized videos, I hope the video shows at least some interactive perspectives of the software product. 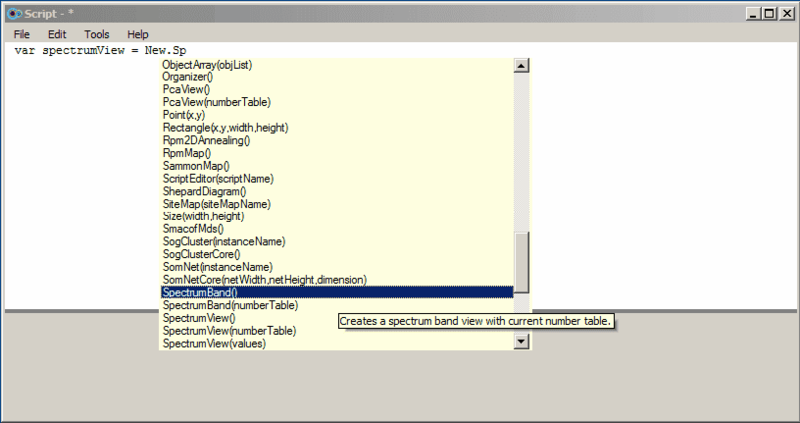 In this example, the data set is a 4000x1700 number table. Each of the 4000 rows represents a compound with about 1700 physical and chemical features. On the top left side the data set is displayed in a PCA map with one dot for each compound (5 clusters are discernible.) On the top right side, the data set is displayed as a heat map with one line for each data row. We have selected about 60 features from the heat map and shown them in a spectrum band view at the lower right side. 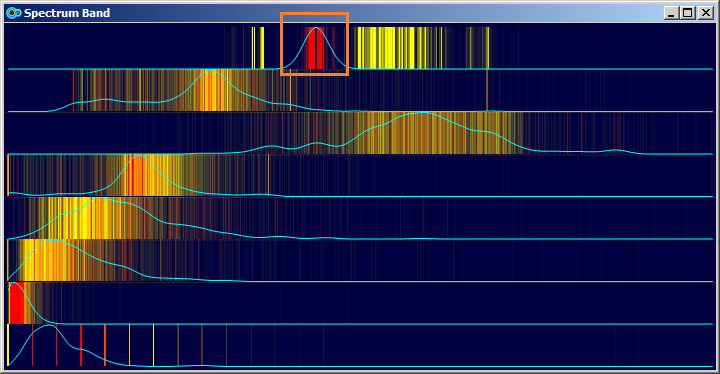 The spectrum band shows each feature as vertical spectrum. We see that most features are more or less Gaussian distributed; some features are discrete as their spectrum comprise only isolated bars. In above picture we have displayed 8 features in a spectrum band with 8 horizontal spectrums. We have selected with the mouse point a small section in the first feature, the spectrum band view immediately shows the density curve (i.e. the distribution) of the other features of selected objects. Mean shift and K-Means algorithm are two similar clustering algorithms; both of them extract information from data with some kind of mean vector operations. Whereas the K-Mean algorithm has been widely popular, the mean shift algorithm has found only limited applications (e.g. for image segmentation.) In this note I'll briefly compare these two algorithms and show a way, with VisuMap software, to combine them to get much better clustering tools. 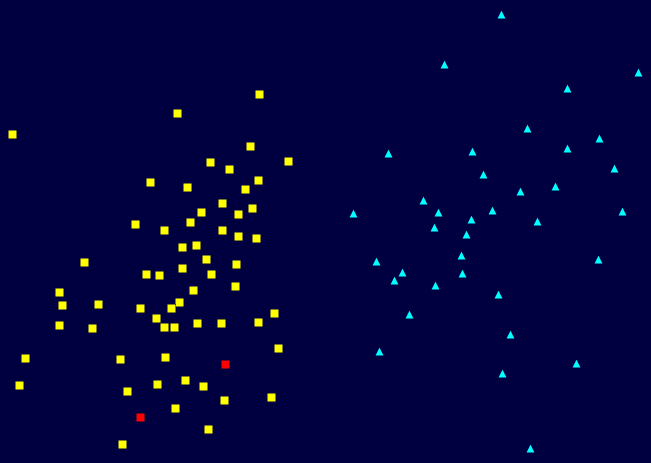 The mean shift clustering algorithm has two main drawbacks. Firstly, the algorithm is pretty calculation intensive; it requires in general O(kN2) operations (which are mainly calculations of Euclidean distance,) where N is the number of data points and k is the number of average iteration steps for each data point. Secondly, the mean shift algorithm relies on sufficient high data density with clear gradient to locate the cluster centers. In particular, the main shift algorithm often fails to find appropriate clusters for so called data outliers, or those data points locating between natural clusters. The second issue normally manifests itself in some small uncertain clusters together with the wanted major clusters. The K-Means algorithm does not have the above two problems. The K-Means algorithm normally requires only O(kN) operations, so that K-Means algorithm can be applied to relatively large dataset. However, K-Means has two significant limitations. Firstly, K-Means algorithm requires that the number of clusters to be pre-determined. In practise, it is often difficult to find the right cluster number, so that we often just pick a sufficiently large cluster number. This will result in situations that some natural clusters will be represented by multiple clusters fund by the K-Means algorithm. We have discussed this issue in a previous blog entry. 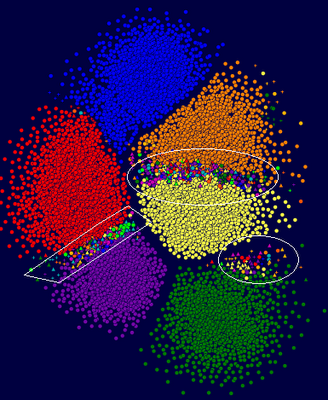 Secondly, the K-Means algorithm is in general incapable to find non-convex clusters (as clusters of K-Means algorithm form a voronoi segmentation of the data space.) 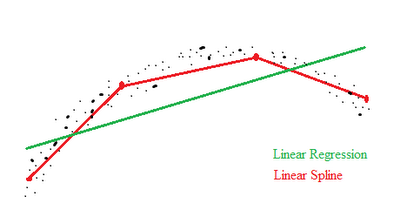 The second limitation makes the K-Means algorithm inadequate for complex non-linear data. Fortunately, there is simple way to overcome the mentioned problems of the two algorithms: we simply combine them together. 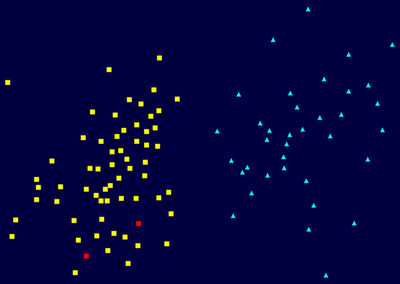 That is, as illustrated in the following picture, we first apply the K-Means algorithm on a dataset; then apply the mean shift algorithm on the cluster centers found by the K-Means algorithm. The mean shift clustering step can be done quickly as its input data (which are the cluster centers of the K-Mean algorithm ) is much smaller than the original dataset. We don't have to know the right cluster number for the K-Means algorithm: a number that is significantly larger than the number of natural clusters will be good enough for the task. 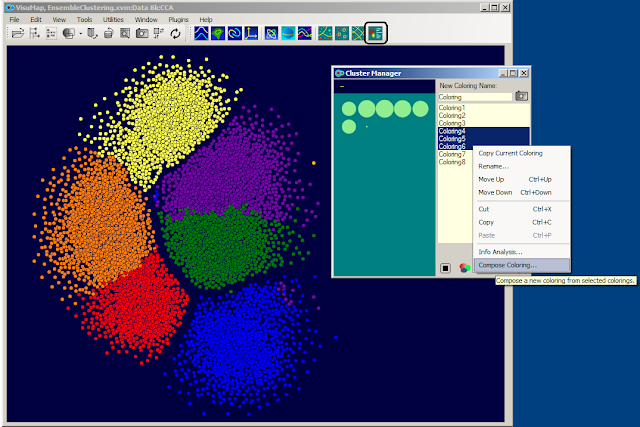 The mean shift step will merge appropriate cluster centers to match the natural clusters. Since the clusters of the K-Means algorithm are normally located in high density sites, the mean shift step will normally not produce small uncertain clusters. Furthermore, the above combination is also capable to find non-convex clusters. 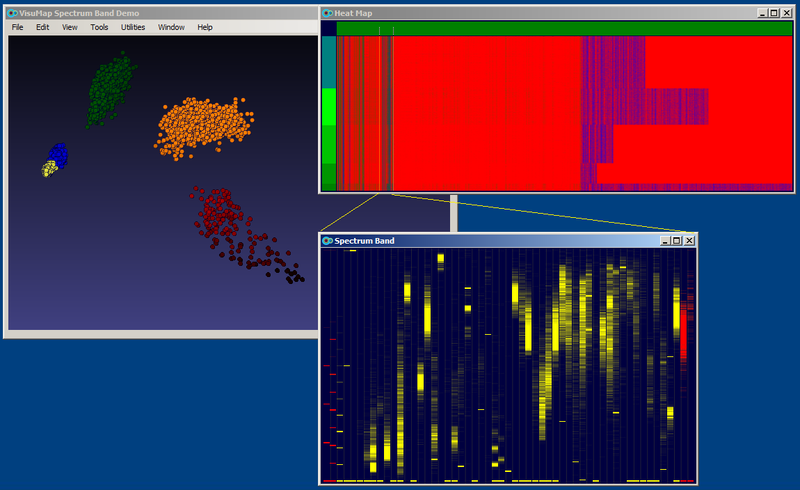 The following video clip demonstrates a such case with the VisuMap software. The following is a series of maps for a data set from flow cytometry. 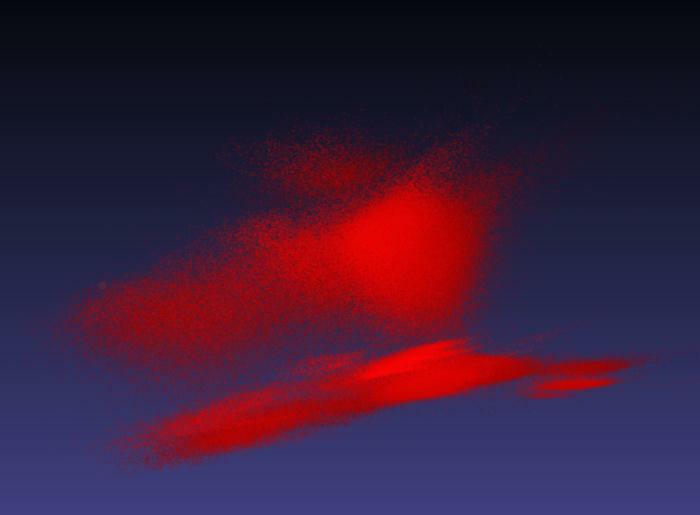 The data set contains 500 000 data points that has 12 numeric attributes for 500 000 cells. 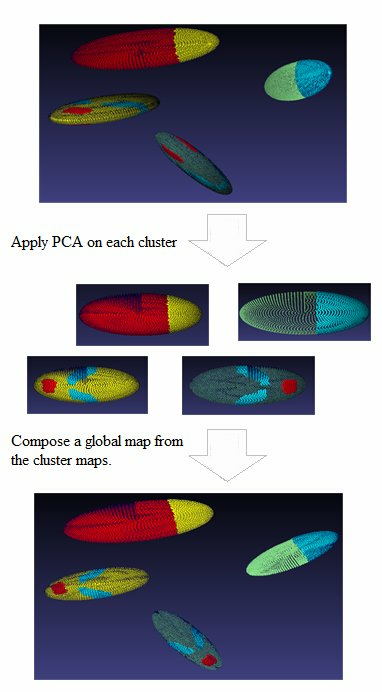 The first map is a typical bi-variate map in flow cytometry analysis; The second map is a PCA map produced with VisuMap; The third map is a PCA map colored with K-Mean and Mean Shift algorithm. We see that the colored PCA map reveals much more details and sub-populations. 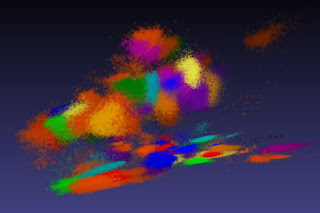 It took about 2 minutes to produce the colored PCA map, whereas more than 10 hours with mean-shift algorithm alone.